Almost through with July already. This year really has flown by. Which is strange because my average working day always seems to last about 101 hours. Strange month for football this one. A World Cup to start, a brief period of nothingness in the middle and then the traditional European humiliations to finish. The summer menu of Scottish football. The summer – or the brief snaps of sunshine amidst the overcast and rainy Scottish days – seems to be dragging and dragging. We're stuck in that strange period when the World Cup seems a distant memory (actually, that maybe not a bad thing) and the start of the SPL doesn't seem to be getting any closer. I've been ruminating on this in between becoming embroiled in a copyright farrago with the SPL and their mysterious agents. Sometimes I wonder why I bother! Thanks as ever to Jeremy at Albion Road. You really should check that site out! So what do you have to say in your interview to get a job with the SFA? "Get your trousers on, you're nicked." Who’d have thought that was the way to impress George Peat? Maybe they were pushed for time that day: "We're the Sweeney, son, and we've haven't had any dinner yet, so unless you want a kickin'..."
Cheap, cheap jokes made at the expense of a man’s surname. But it say’s a lot about Stewart Regan’s appointment as SFA Chief Executive that my first thought was about a 1970’s cop show that I’m too young to remember first time round. Looking for a man to run a sporting organisation in a country that’s often caricatured as having deep pockets and short arms? Yorkshire County Cricket Club is probably a good place to start and finish your search. I don’t know enough about his time trying to monetise the appeal of leather on willow to comment about his suitability. Some will sneer, of course, at the very mention of cricket. I’m not one of them. Don’t really care. If he’s good enough then he could have been running the International Egg and Spoon Race Advisory Council. But will he be good enough? A recent error over the hosting of one Pakistan’s England based cricket tests probably shouldn’t be allowed to overshadow what I gather has been a relatively successful period for Yorkshire financially. On the pitch things haven’t gone quite as well, although the history of underachievement in Yorkshire cricket mirrors the history of Scottish football, but he leaves them at the top of both the leagues they compete in. Regan also has football experience on his CV having overseen the strategy that turned the old first - née second - division of English football into the Championsip. He’s certainly got an interesting job ahead. The SFA needs solutions to problems both on and off the pitch. The McLeish Report needs to be actioned or - if it is to be ignored - alternatives need to be found. The nation is watching and waiting, demanding that some kind of change happens sooner rather than later. We’ll be expecting Stewart Regan to show us what direction he plans to take before too long. "As an outsider looking in I have seen lots of fallouts, lots of disagreements, challenges and criticisms of how things are done. There hasn't been enough focus on the common agenda." One thing he’ll need to remember in his new post though. If he fails we’re going to be “utterly and abjectly pissed off." A couple of days away from blogging. Busy at work, too busy to even conjure up ways of pretending to be too busy to do anything. A horrible, wicked vicious circle that. It’s maybe just as well. I’ve been getting withdrawal symptoms since the end of the World Cup. We moan - and I moan more than anyone - about Scottish football. But I’m beginning to miss it. We’ve had a few European ties of course, but it remains difficult to get excited about these European qualifiers. I think it’s the dull inevitability that at least one of our teams will encounter a disastrous result and then blame it on the early season start. Really? We’ve been stuck playing these games for years now. Rethink your preparation instead of wandering into them like a punch drunk boxer wandering into a flurry of left hooks. No, this is the football blogger’s downtime. Well, this football blogger anyway. So time ticks slowly by. And the strange thing is you begin to look forward to new season. 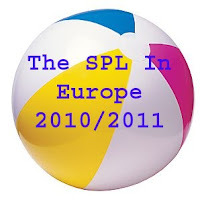 It’s not a shouting it from the rooftops excitement - this remains the SPL - but there’s certainly more anticipation than you would have expected back in May. A Scotland qualifying campaign with a new manager and, one would expect, a reasonably new look side. Including the world’s best team strutting their stuff at Hampden. Bring it on. Are Celtic transformed as well as revamped? Can a depleted Rangers remain stoic in their title defence? Are Dundee United ready to take another step forward? Are Hearts or Hibs gearing up to declare themselves the “third force?” Can Danny Lennon, Terry Butcher or Mixu spring a surpise and silence the doubters with a charge up the table? Can one of our teams ignore recent experience and get a bit of momentum going in Europe? A Rangers run in the Champion’s League or United, Hibs or Motherwell bringing the Europa group stage back to Scotland. Because football’s downtime is also a time of endless possibilities, a time to ignore the lessons of history and allow ourselves to dream. Who doesn’t sometimes give in to that temptation? When you get the first glimpse of your season ticket book, make plans for the first pints on the first away trip of the season with the same old miserable sods who drifted away in about March last season saying they wouldn’t be back until the manager was shown the door. When the emails start pinging around trying to sort out who will be hosting the first big televised game, who’ll be in charge of ordering pizza online, who’ll be bringing the beer - and this time, please, a normal selection rather than a pick ‘n’ mix of continental lagers. Pizza, beer and football should be a pleasure not a geography lesson. Admit it. You’re all getting a bit excited. Of course your hopes will be dashed. But there will be one game that leads to a cracking day or night out. There will be one game on the television where the drinks and the pizza are the perfect accompaniment to a game that lifts your spirits, convinces you that football remains the best entertainment you can get. And it’s the memories of those days and nights that fuel the anticipation at this time of year. The defeats, the disappointments, the letdowns. We need them, they bond us to our clubs, but it’s the brief moments when the most imperfect of sports somehow becomes the most perfect of games that keep us coming back.